Hargeisa(ANN)-Somaliland Roads Development Authority (RDA) has today launched an up scaling and reform initiative to be implemented by RDA with the collaboration of University of Hargeisa (UoH) and other civil society organizations. The launch event which was held at University of Hargeisa saw participation of high level governmental officials including Minister of Transport and Roads Development Abdillahi Abokor Osman and Director of Roads Development Authority Osman Sheikh Abdi Sheikh Mohamed along with other various stakeholders including community based roads development associations, civil society organizations, traditional leaders, religious leaders, media groups as well as engineers and academicians from University of Hargeisa. RDA Director Osman Sheikh Abdi who addressed the event emphasized importance of roads development for economic improvement and social integration across Somaliland regions. “We are launching this initiative today to make reforms in the roads development approaches, ensure that our programmes are led by researches and upscale implementation of ongoing projects. 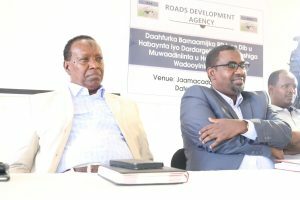 We would also strengthen the coordination mechanisms among stakeholders involved in the development of roads and related infrastructures” Director Osman Shekh Abdi said. Mr. Abdi added that RDA initiatives are inline with President’s vision and the wider national development plan of the country. 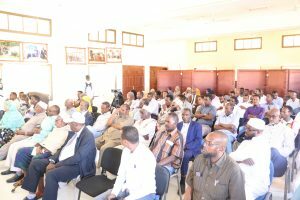 He urged diaspora associations, private sector actors and civil society organizations to take part the development and maintenance of Somaliland’s key roads. The President of University of Hargeisa Prof. Mohamed Yousuf praised RDA for holding this important meeting at University of Hargeisa and creating collaboration and working relationship between the two organizations. “University of Hargeisa welcomes any working relationship between RDA and UoH. We would provide support in researches and contribute to technical aspects of projects that RDA implements” Prof. Mohamed Yousuf said. Abdiaziz Hersi Warsame from Somaliland Y-PEER, who also provided speech at the event, commended RDA for this coordination and up scaling initiative. He said Y-PEER is already a partner of RDA and is willing to take part in this new endeavor as well. Finally, the Minister of Transport and Roads Development Abdillahi Abokor officially launched the program. “We gathered here today to listen to you, to consult with you and to work with you on the development of Somaliland roads which are vital for the wider economic growth of the country” Minister Abokor said. Finally, Minister Abokor told participants that President Muse Bihi encouraged all governmental institutions to utilize research and development units of Somaliland universities.